Do you like to entertain? I just love it! We just adopted a new four legged furry friend so I have not been able to have any shindigs lately. I really miss that aspect of my life. 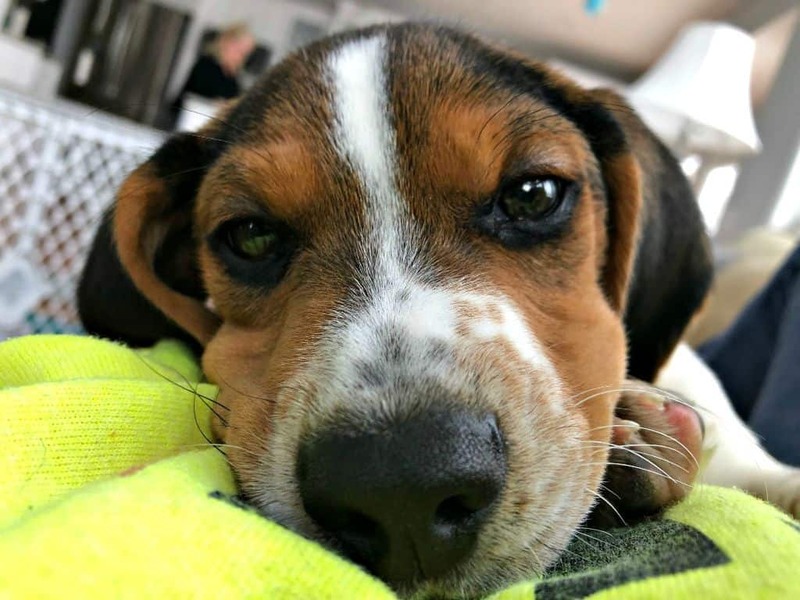 Charlie is a cute little bundle but he has the energy of a freight train. We will get back to entertaining soon. 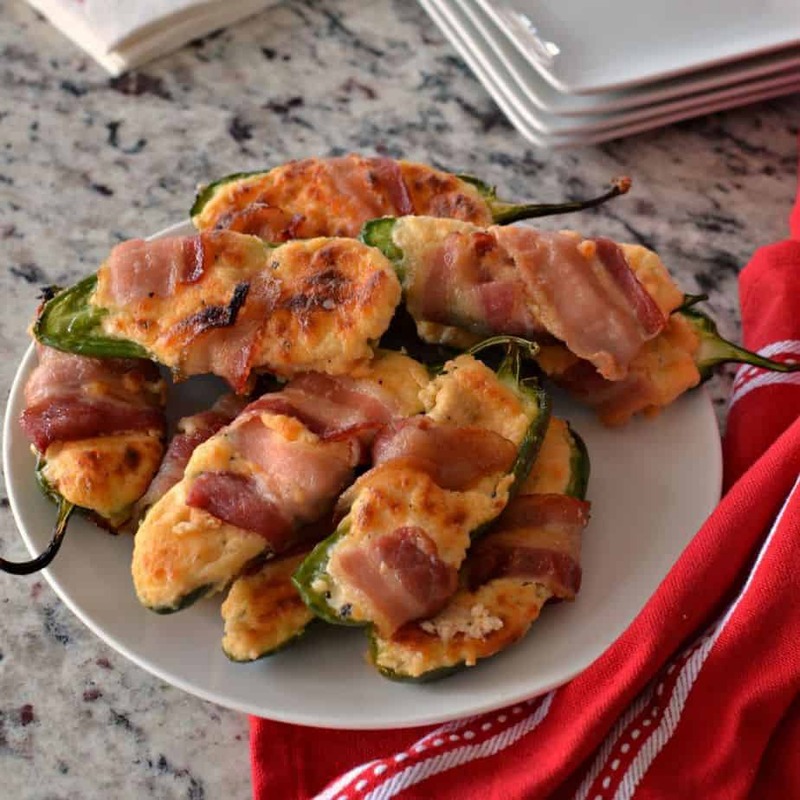 These Bacon Wrapped Jalapeno Poppers are always a hit with family and friends. Usually a double batch is in order since they are one of the first appetizers to disappear. 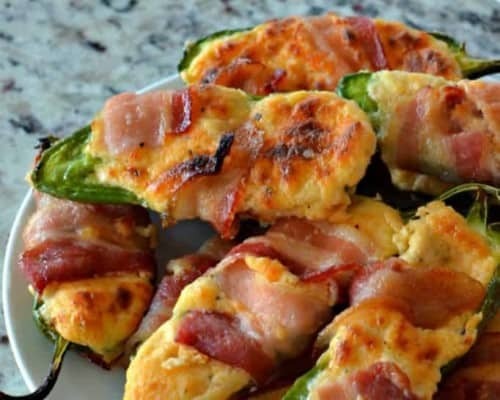 How do you make Bacon Wrapped Jalapeno Poppers? First cut the jalapenos in half lengthwise. Using a spoon or melon baller remove the veins and seeds. In other words get the guts right out of there. Place on baking sheet covered with parchment paper or aluminum foil cut side up. Using a mixer blend the cream cheese, cheddar, monterery jack, onion powder, garlic powder, salt and pepper until smooth and creamy. Spoon into the pepper going a little more than level with the sides. If you stuff it to full it will bake out of the pepper. Wrap the stuffed pepper with one half slice of bacon working it so the seam side of the bacon is on the bottom. Place seam side down on baking sheet. Bake for fifteen to twenty minutes or until the bacon is browned. Serve warm or at room temperature! They are delicious either way. How do you pick mild jalapenos for Bacon Wrapped Jalapeno Poppers? With just a little patience and understanding you can pick jalapenos that are flavorful yet mild. Look for the younger peppers that are smooth and green all over. They should be free of striations. These young peppers are less stressed and milder. The red ones are older and hotter. Stay away from peppers with white lines and flecks as these peppers are older and hotter. Take your time picking the peppers. Also remember to scoop out the veins and seeds. If you like your jalapeno peppers hot leave the seeds and veins in or leave a portion of them. 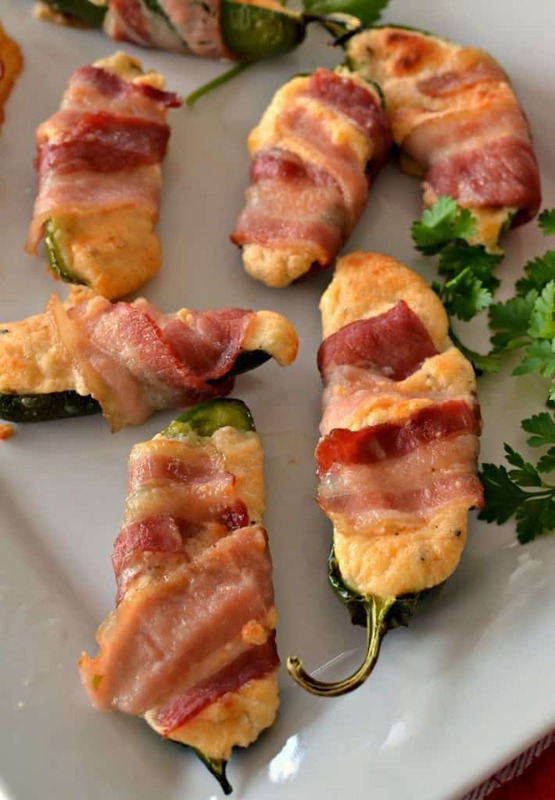 What bacon is best for Bacon Wrapped Jalapeno Poppers? Pick a bacon that is not too thick nor too thin. If it is too thick it will be hard to mold around the poppers and will not get as crispy. If it is too thin it might tear or break during the wrapping process. I personally love Coleman naturally uncured hickory smoked bacon but any good quality smoked bacon will work. 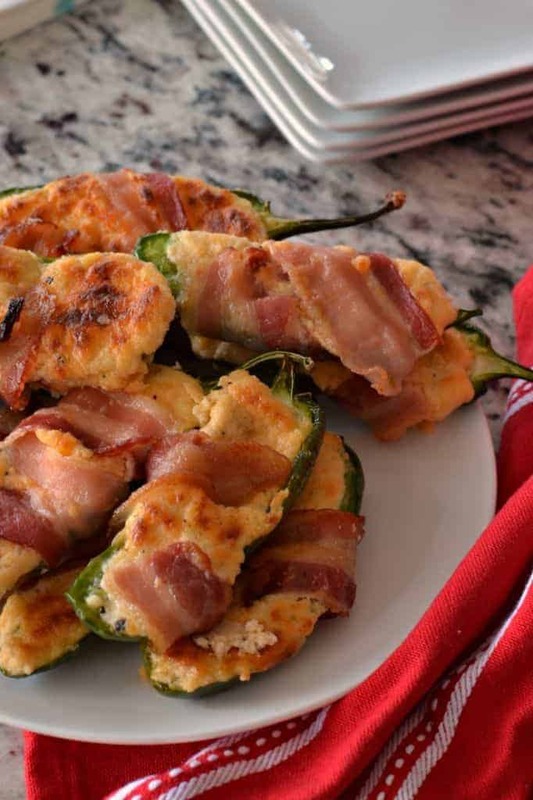 Can Bacon Wrapped Jalapeno Poppers be made ahead of time? These Poppers can be made ahead of time using one of two methods. My preferred method is to stuff them with the cream cheese mixture, wrap with bacon and place on a baking sheet covered with parchment paper or aluminum foil. Cover with plastic wrap and store in the fridge for up to two days. When ready to enjoy simply remove the plastic wrap and bake. The second method would be to follow the recipe through including baking. Cool them, then store in the fridge in a single layer. Reheat in the microwave for about one minute at 50% power. They are still delicious but the bacon is not as crispy as in the preferred method. 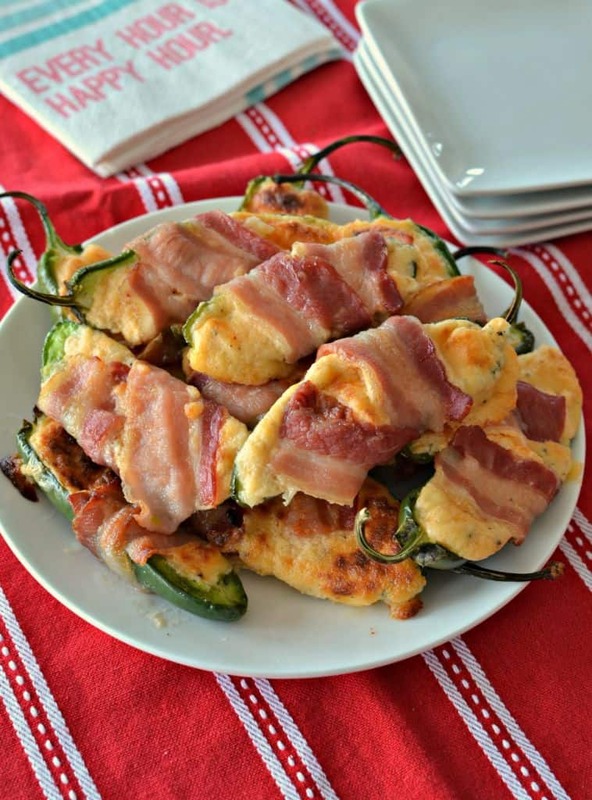 Can Bacon Wrapped Jalapeno Poppers be frozen? Yes they most certainly can. For best results stuff them with cheese and wrap with bacon. Then line them on cookie sheets covered with wax pepper. Make sure they are not touching or they will all freeze together. Place in in the freezer until frozen. This method is know as flash freezing. Once frozen store in a Ziploc freezer bag with as much air removed as possible. When ready to cook place them on parchment or aluminum covered baking sheets. Let them thaw while the oven preheats. Pop in the oven and cook as the directions read. They may require an additional one to two minutes baking time. 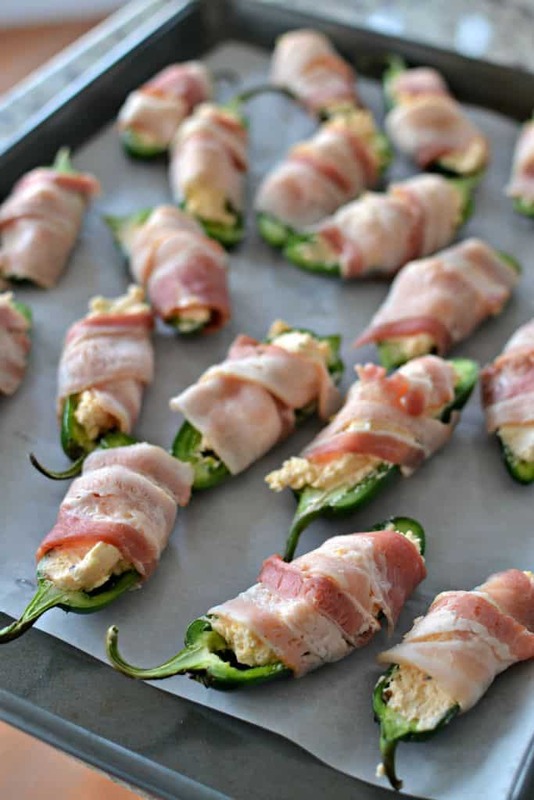 Helpful tips for making Bacon Wrapped Jalapeno Poppers Recipe! Pick jalapeno peppers without striations or lines in the outer skin. They should be smooth, green and without white lines or flecks. For mild jalapeno poppers remove the veins and seeds from the peppers. Don’t be tempted to overfill the peppers. Fill to even with the sides or maybe a pinch over or the cheese may cook out and make a mess. Wrap the bacon around the pepper so the seam is on the bottom of the pepper. Then place seam side down on parchment or aluminum covered baking sheets. For added bacon crispiness turn the broiler on the last minute of cooking. Be aware that broilers in most ovens are unpredictable so stay close by and peek a couple of times. If you are not familiar with your broiler or you have an ancient stove it might be best if you skip this step. 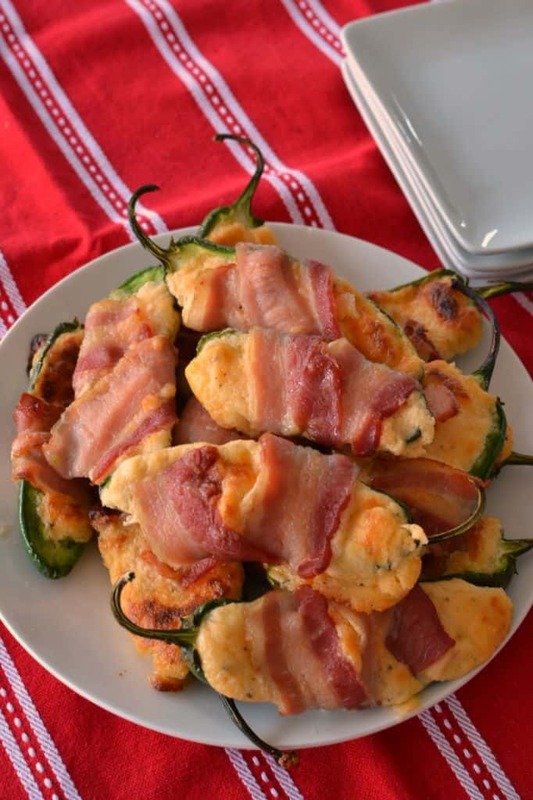 Bacon Wrapped Jalapeno Poppers are the perfect party appetizer or game day food. Prepare to have your tastes buds tantalized. Preheat oven to 400 degrees. Cover baking sheet with parchment paper or aluminum foil. Cut the jalapenos in half lengthwise. Using a spoon or melon baller remove the veins and seeds. Place on baking sheet cut side up. Using a mixer blend the cream cheese, cheddar, Monterrey Jack, onion powder, garlic powder, salt and pepper until smooth and creamy. Spoon into the pepper going a little more than level with the sides. Wrap each stuffed pepper with bacon. Wrapping so the bacon seam is on the bottom and place on baking sheet. Bake for 15 to 20 minutes or until bacon is browned. Serve warm or at room temperature. I made these for my book club and everyone wanted the recipe! SO darned good!!! Love that these are wrapped in bacon, makes they so yummy! Oh my, these look incredibly delicious!! The perfect appetizer!! I made these last weekend when my son had some friends over and they were a huge hit! LOVE how flavorful these are! They’re always gone so fast! These are one of our all time favorite appetizers! !